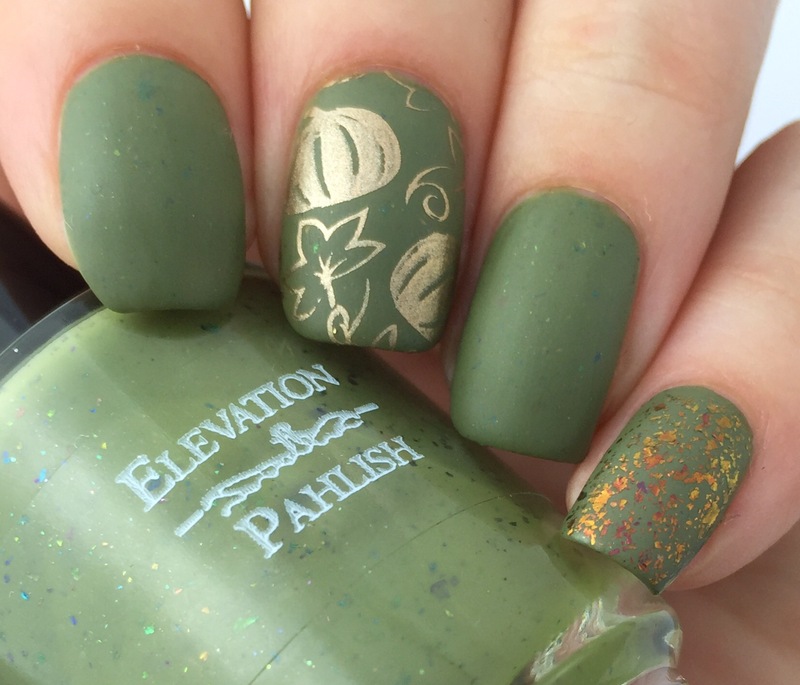 I’ve got some simple nail art to get your (possibly quite chilly) Fall morning started! 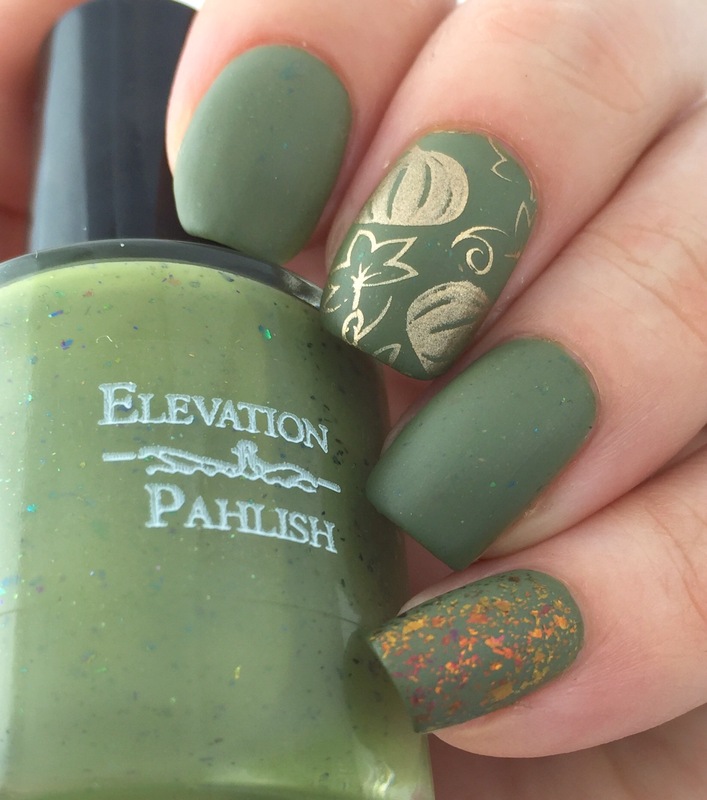 I’ve been seeing tons of amazing flakies and thought I’d take one of my recent faves- Pahlish’s “Cricket Minister”- and make it matte. (You can catch my review here.) It was an experiment, since I wasn’t 100% sure you would be able to see the flakies once it was matted, but I think they’re still making a strong showing. 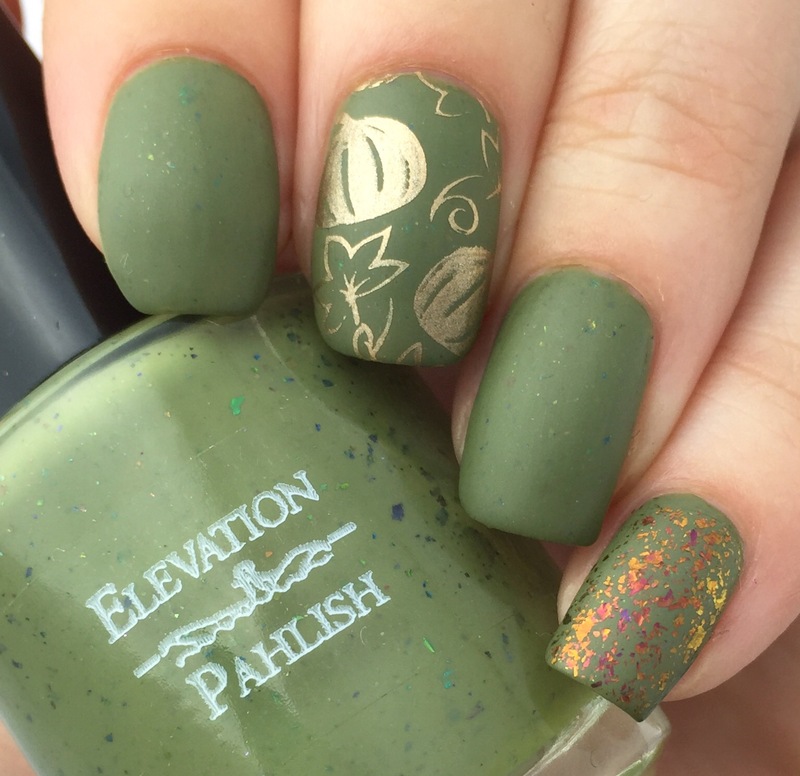 To add to the Fall-ness, I added an accent nail of stamped gold (Maybelline “Bold Gold”) pumpkins and leaves using Bundle Monster BM-XL27. 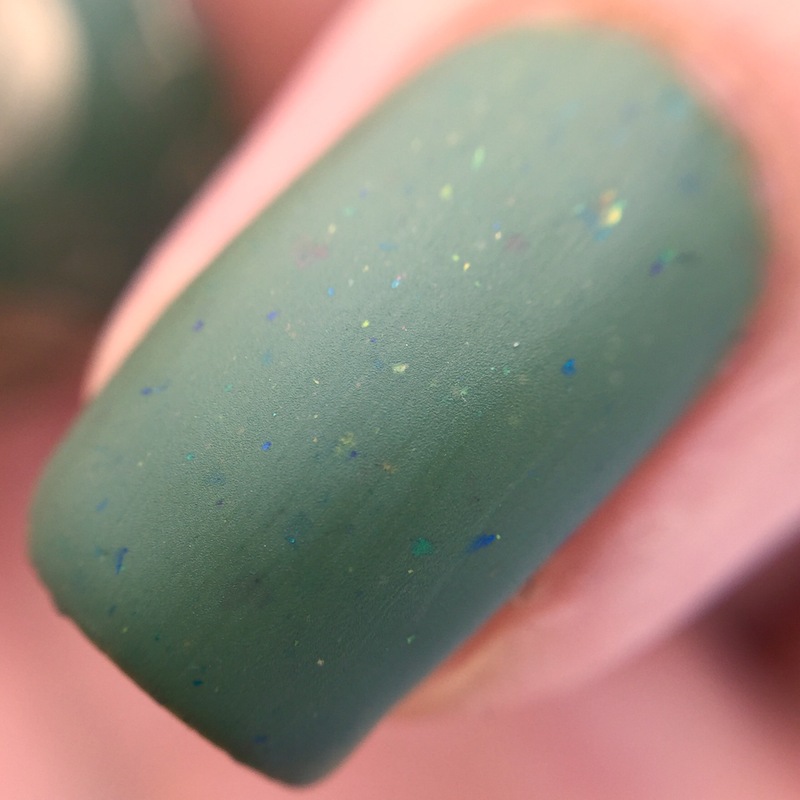 I also added a second accent of ILNP “Glory” (reviewed in all its glory here) because I really wanted to see it matted. Worth it. My camera really had a rough time trying to understand the greens and yellows all in context, and desperately trying to capture the look of the matte, so you’ll notice some variation in the shade of the green. Suffice it to say that in natural light, this took on an ever slightly bluer green tone, while it leaned the yellower olive indoors and in artificial light. What are your thoughts? I can say that doing this mani has put me in a “matte all the things!” mood. But I feel like I’m going to go matte crazy, then I’m going to have to figure out how to photograph it. Also I’m gonna need some login’ for my poor chilly cuticles. Suggestions? The combination of pea green and gold is an interesting one. I have Maybelline Bold Gold and I didn’t realize it stamped so well. Must get to work! I think there’s two versions of Bold Gold- I have the one where the bottle claims to be “holo” and it’s the one that stamps less well, according to reports. I love the flakes over the green!! Gorgeous! I really love the gold pumpkin with the green base! The golden pumpkin looks so perfect against the green. The matte just really seals the whole design off so perfectly, I’m obsessed with matte finishes lately. I LOVE that flakie over this base. Gorgeous. These are both lovely! Beautiful on you. Love the green and gold together. 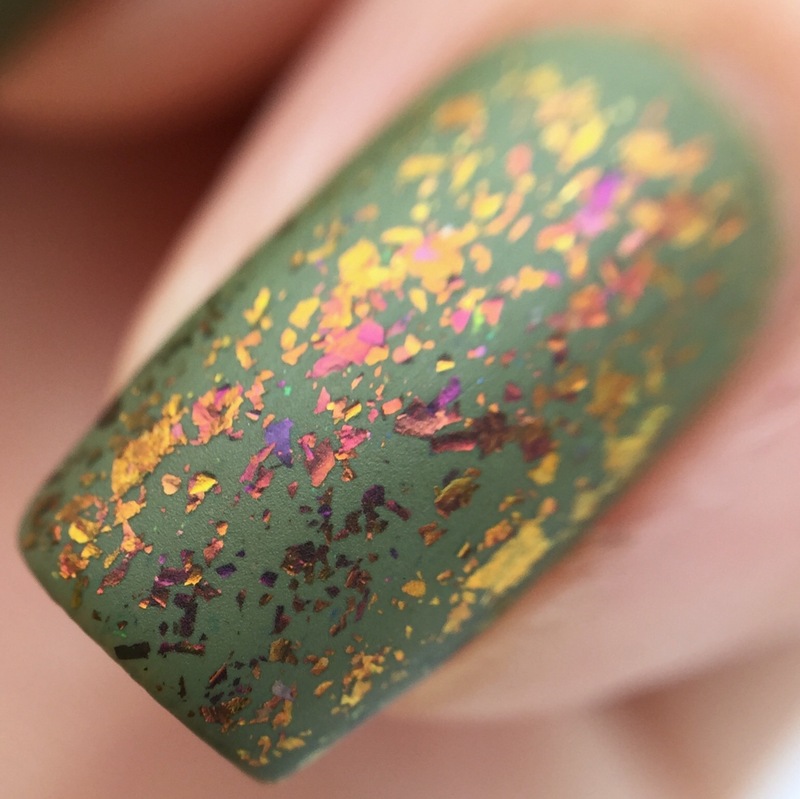 I usually think of Christmas with that color combo but Cricket is just mossy enough that it has that fall feeling to it. And you are right about the 2 version of Bold Gold. 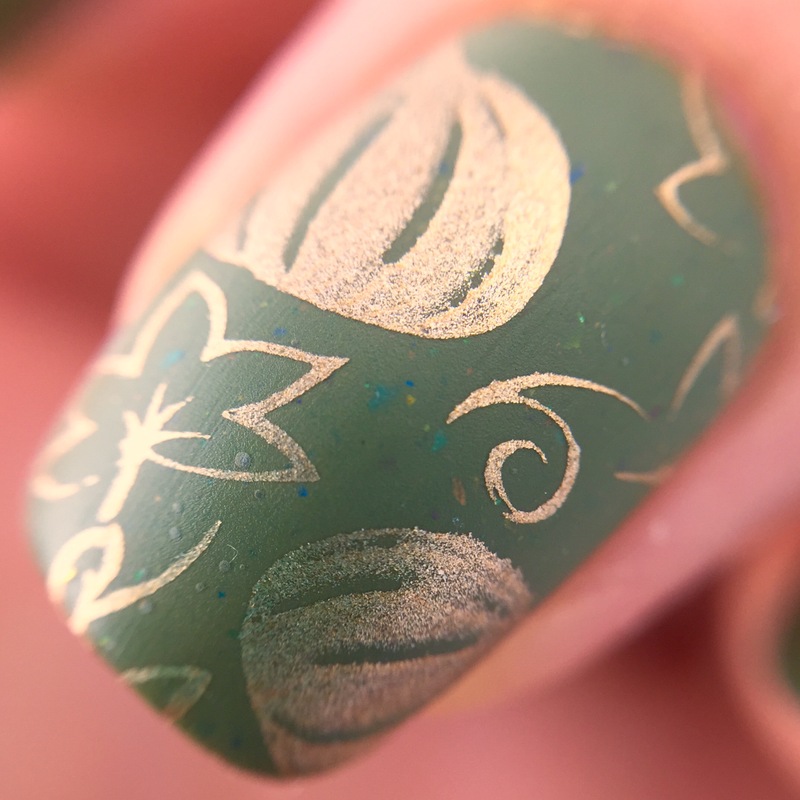 The one I have is labeled Metallic instead of Holo but it still works great for stamping.